Powered subwoofer with onboard limiter and custom-designed Class D amplifier. The KPX18A Subwoofer is designed to deliver the extended low frequencies you need to enhance your live sound. This rigid cabinet is ported and tuned to maximize the efficiency of the 18 in. driver, filling the room with bass you can hear and feel. The back panel is loaded with the features any DJ or sound engineer needs to optimize the performance of their sound system. 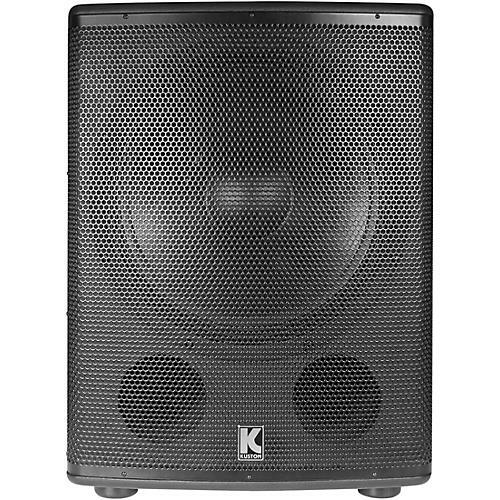 The KPX18A is powered by Kustom’s own Class D Amplifier rated at 1000 Watts Peak Power. This amplifier module is designed to work seamlessly with the professional grade preamp and transducers that go into every Kustom product. The amplifier features onboard DCT (Dynamic Clip Thresholding) Limiter that continuously monitors the available headroom and gain to provide the maximum level of reliable power. KPX18A subwoofer features Left and Right XLR inputs with XLR thru jacks, High Pass XLR Outputs, Sub Volume control, Phase Invert switch, oversized ergonomic cup handles, steel grille and steel stand mount adapter. Give your music what it's been missing—order your Kustom subwoofer today.